So many of us who love music down here on the Island complain about our venues or the lack there of. So it’s very pleasurable to announce that in the next six weeks or so we are in for a huge selection of live musical treats in a variety of spaces and across a range of styles. It all starts this weekend with a special gig from Plastic Mermaids at Quay Arts. Rehearsal pictures show the band adding a choir and string section into their already big sound. This is a band very much on the rise with a wide creative vision and with their debut EP dropping at the end of the month on Cross Keys Records (bright blue vinyl!) they are sure to be on hot form. Hard lines if you haven’t got a ticket though as it’s sold out already! Saturday night also sees the return of house night Where?House to the Blacksheep. This sporadic party always finds Assembly Records boss Brett Lawrence and Baci Recordings Sam Franklin dropping the deepest of house grooves though the heavy soundsystem of 3rd Dimension Sound. They are joined by Space (Ibiza) and Pacha (London) guest Jamie Brennan to celebrate Brett’s birthday. Thursday evening has live music at the Blacksheep with the third Songbird Session. Claydon Connor and Gug Page from Studio 5A present another instalment of their showcase for upcoming artists and bands with recent Headfunk Show guests Duvueax headlining. The following weekend there is spoken word at Quay Arts from Dizraeli (without the Small Gods this time) supported by KOV and Buddy Carson, whilst over in Ryde Wight Night Events takeover the Balcony with guests Andy Carroll and Paul Bleasdale, both of whom were residents at iconic Liverpool club Cream for many years helping to shape the sound of this legendary night. Live blues on Friday March 14th from Eugene ‘Hideaway’ Bridges who was on last July the Island for Rhythmtree before Saturday 15th sees Seasons return to the Blacksheep for their second party and this time they’ve gone all-out with their special guest – Quest. Quest has been a figurehead in the deep end of dubstep and bass for many years releasing classic 12″s on the Deep Medi label and the Seasons crew are bringing in some extra bass scoops to add to A Higher Sound’s already special system. HEAVY! 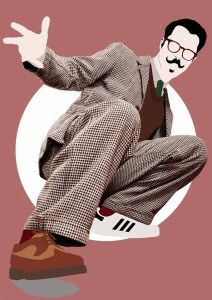 Jump forward a week and Galactic Events are holding one of the highlights of the Acoustic Isle festival with Mr. B the Gentleman Rhymer performing live at Coburgs with support from Jay Foreman along with a few local hoodlums. Chap hop ahoy. You can have a weekend off at the end of the month and then April opens up with two contrasting gigs from the Rhythmtree crew. First up it’s Bambaataa on Saturday 5th April with special guest dj Cal Jader. Cal is the chief firestarter of the Movimientos crew in London and he will be bringing his bag of latin and afro heat to the party. The following week Rhythmtree will be taking over Freshwater Memorial Hall for a series of monthly gigs called Live At The MeMo. First up they have cross-cultural project Playing For Change on 12th April with more treats promised throughout the year. Keep an eye on your cash, it’s going to be a busy few weeks!